All composers endure bad performances of their music. It’s always demoralizing and undermines self-confidence. Inevitably the question arises in the mind: “was it their fault or mine?” and we all know how those questions tend to be answered. The composer loses confidence in the piece and has doubts about her own judgement. Some solace can be taken in the knowledge that this experience is universal: it happens to all composers, the famous and the obscure, and at all points in their careers. This point was driven home to me recently when I discovered John Cage, in conversation with Morton Feldman, describing the impact of a bad performance of his Concerto for prepared piano. They had done it with students … and they’d spent several months putting it together. Whereas, you remember, at Cooper Union [the premiere performance, January 1952], I think fifteen minutes were taken by the union musicians and most of those minutes were spent laughing at what they were obliged to do. So that I had never really heard the piece and all these years I thought of it as something that I’d avoid hearing. And when I was in Urbana, John Garvey, who had conducted it, spent five days trying to persuade me to come and listen to the recording. Finally, on the fifth day I had nothing better to do and I listened to it and I was surprised. The piece is quite extraordinarily interesting in this sense: that each sound, each thing that happens, is, well … nothing that precedes it prepares you for the experience. So I think even if you were not interested that you would become interested at some point. This story of fear and humiliation, told in 1967 when Cage was 55 and a world-famous composer, finally answers a question that has been nagging me for years: why didn’t he discuss this piece in his writings, lectures, and interviews of the 1950s and 1960s? 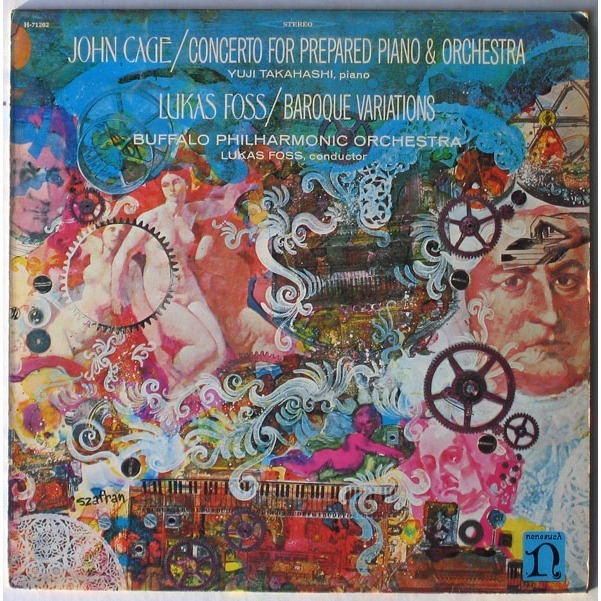 The concerto was a pivotal work—perhaps the pivotal work—in Cage’s career, the first work in which he used chance operations. But in the years following its composition, he never mentioned this. Cage talked often about Music of changes, so much so that for many years I was under the impression (probably like many others) that it was the first piece to use chance. One would think that the concerto, a work that played such an important role in Cage’s work, would be more prominent in his explanation of his turn towards chance. This has always bothered me, but now I see why the concerto was hidden from view: Cage, haunted by the wretched first performance, thought of it as something to avoid. And the 1952 Cooper Union performance wasn’t even his first unpleasant experience with getting the concerto performed. Originally, the premiere was to be held at the Hartt School of Music in March, 1951. The programs for that concert list the concerto (with Cage as soloist), but the review of the concert doesn’t mention the piece, only that Cage played parts of the Sonatas and interludes: clearly, the concerto was scrapped at the last minute. I don’t even want to think of what that experience was like. The moral to this story is to never underestimate the power of a bad performance. I’m sure that variants of this same story have played out over and over in the lives of most composers: putting a work in a dark corner of a high shelf just so you don’t have to think about that awful performance again. Every composer may have one of these unfortunate works lurking in their studio, gathering dust. It can be heartening, though, to find that even a figure as prominent and seemingly full of self-confidence as the legendary John Cage had exactly this same experience. And the ending of this story is uplifting, too. Composers out there: what “extraordinarily interesting” piece of yours is waiting rediscovery right now, waiting to be freed from those bad memories of long ago?